After having taken her exams in 2002 at the musicconservatory in Alkmaar, Holland, Eveline van Kampen decided it was time for her to set her musical dreams in the agenda. In order to realize this, she contacted Peter H Boer, who also had contributed on her examsproject at the conservatory. Peter also has a progressive-fusion band called Songs of the Exile (S.O.T.E), where also drummer Emile Boellaard comes from. Esther Ladiges had completed her education at the same conservatory and moreover had experiences from bands as: Sangamo, Ixion, Entropy and Ayreon. During the first years came and went a couple of keyboardplayers before the position became permanent through Annemieke de Boer's admissions to the band. It begun with , both Evelines own composed musics, and a part covers from bands like: Pain of Salvation, Fates Warning, which man did in order to find its own musical niche, and they used the inspiration from mentioned bands in order to create something their own and unique. 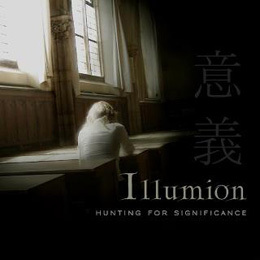 Illumion, according to the pressrelease is like: The Gathering meets Magenta, with Ayreon-influenses, and certainly one can hear these bands tonalities when listening to the band's debut disc, "Hunting for significance" for also here it is about goodsounding and technical played symfonisk progressive, with a big feminist feature over itself, which is only natural with a female singer/front person. I am not so known with The Gatherings music, but certainly with Ayreons discs and above all Magentas later products that speak to me substantialy, and this then among other things for its Female vocals. Textwise ï¿½ Hunting for significanceï¿½ has been inspired by historical events, literature and travels, and has here been interwoven mysticism about the humane mind/the brain, and everything together creates an imaginary fantasy world. Musicaly it is clad in an extremely well executed and intricat symphonic coat, here above all Eveline's guitar playing stands at the center. I have no experience with female progressive guitarrists, and few big experiences of female progressive musicians in other respects for that matter, and have therefore nothing to compare it with, but it will directly be said that these musicians actually can do their thing! Eveline has a tone, frasing, technique and variation in her playing that is fully comparable with her male counterparts, and she doesn't dwell in the quackmire of guitar masturbation that so many guitarists otherwise have a tendency to do too often. Her playing is always very tasteful and beautifuly expressed, while she sometimes glimmers and burns in a short extremely technical solo. Her fellow musicians are also wextremely capable on their respective instruments, and Evelines composes musics on a very sophisticated but tasteful level. Here and there it burns in an controlled way and becomes substantially heavy, what breaks against the sometimes so wellplaced musical pattern. Esther Ladiges has a very beautiful, quite delicate voice and it is here where my only negative thoughts of the dosc comes in, namely that the voice sometimes becomes little too beautiful and atmostpheric all over to speak to me. I would have been comfortable with little Angela Gossow (Arch Enemy) - grunts, or why not a little male voices in the heavy passages in order to create a little additional weight and brutality. This is however only a purely subjective reflection that only stands for me, but this would have increased the face value factor further. I Must however recognize that for each time I play the disc I less and less take notice of this "negative", only enjoying only the utmost melodic music that Illumion delivers. All tracs on the disc are of a surprising even and high quality for a debut work, and it is noticed especially in the very varying tunes, and the very solid instrument handicraft. The tracts that nevertheless set themselves a little extra above the rest 'The Prophecy', here Evelines guitar playing shines with so much extra flair in several jazz/fusion like solos, but also 'Into the labyrinth' and 'Died for beauty' gives extra listeningsvalue. On 'Metamorphosis' that tells about Chinese dynasties upturn/fall, a guest appearance of Marjolijn Kaiser on the instrument Pipa, which is a kind of 4-stringed Chinese lute, gives this one a extra little oriental touch. Here and there, on a couple of tracks, I recognize some tonalities and frasings of our own greats Wolverine. The production of the disc has been done in Peter H. Boer's "The Granny Attic studios" Peter has also produced, mixed and mastered the disc in a highly competent way, which has resulted in a very wellsounding endresult, with a distinct, clear and at the same time organic sound picture, where the instruments are balanced well. In order to tie together the bag in a good way I can only establish that, Illumion has created a very good and varying disc, where all musicians, and in this case it is actualy 4 out of 6 being female, delivers in full a supercompetent progressive disc, that gives a taste for repeat listenings.